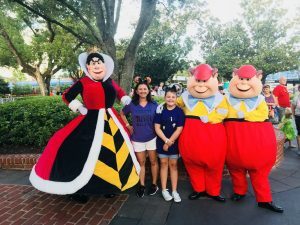 Chicken Guy at Disney Springs is a quick, inexpensive great option while visiting Disney World! There are so many options to choose from when eating at Disney Springs that it can be overwhelming to decide what to eat! The lines can be long, the prices a bit high but Chicken Guy is breaking this trend! 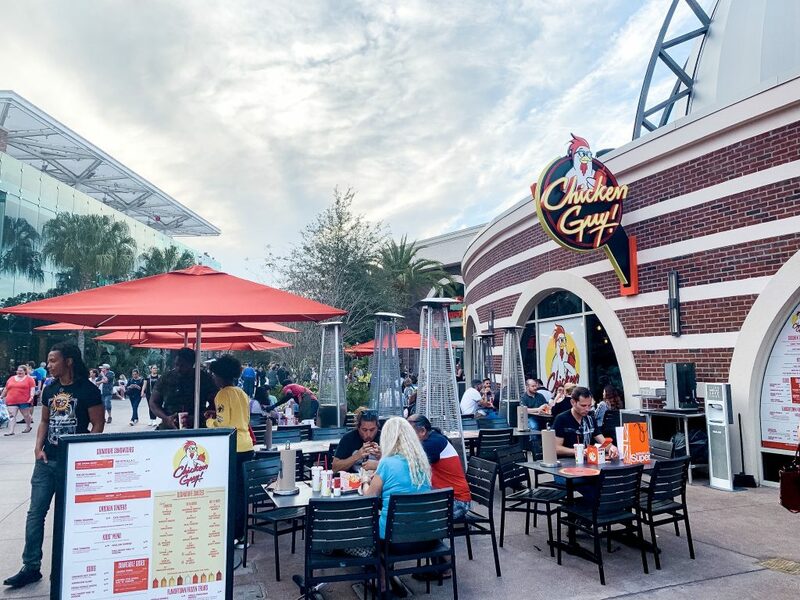 Chicken Guy is a quick service restaurant (meaning reservations not needed) located in Disney Springs near the Orange Garage and Planet Hollywood. They serve all things chicken both grilled and hand breaded! 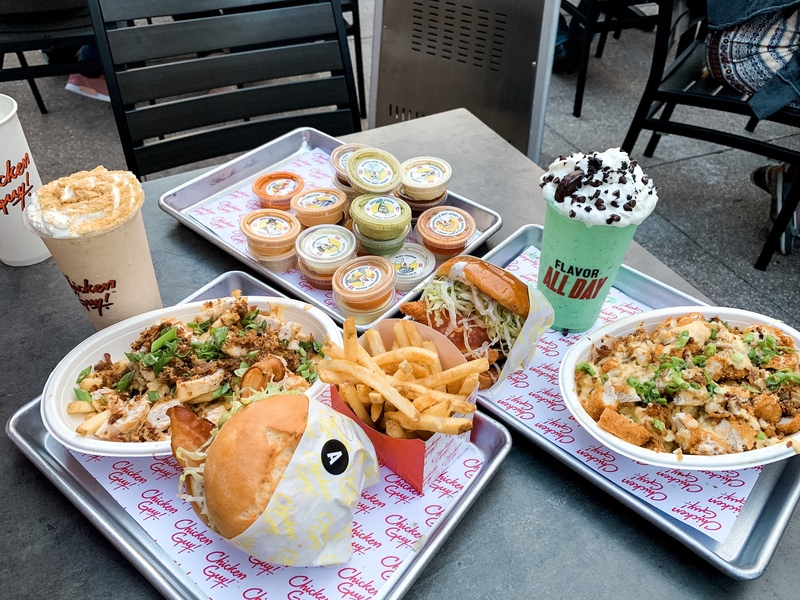 Chicken Guy was dreamed up by Guy Fieri and delivered to Disney Springs with the idea that good food can be affordable and fast! To add to the flavorful fun this Boss of Sauce has introduced 22 sauces to be served up with your favorite chicken sandwich or tenders of choice! I may use the sauces for my fries too… that’s ok, right? Reservations are not needed to eat at Chicken Guy. This is a quick service location and therefore you can show up at your own convenience. Even when the line is long it moves quickly. There is an abundance of seating at Chicken Guy. Most seating is outdoors but all of the tables are well shaded. There are a handful of tables inside but these may require a wait in hotter months. 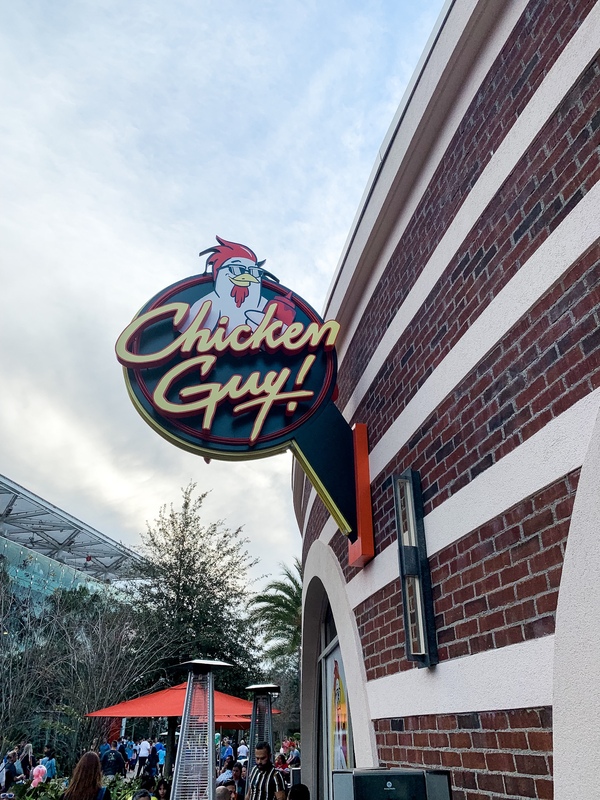 Chicken Guy is located at Disney Springs near the Orange Garage and behind Planet Hollywood. Disney Springs is a large and recently expanded food, shopping and entertainment district at Disney World. There are two parking garages, the Lime Garage and the Orange Garage with a third garage opening soon across the street. 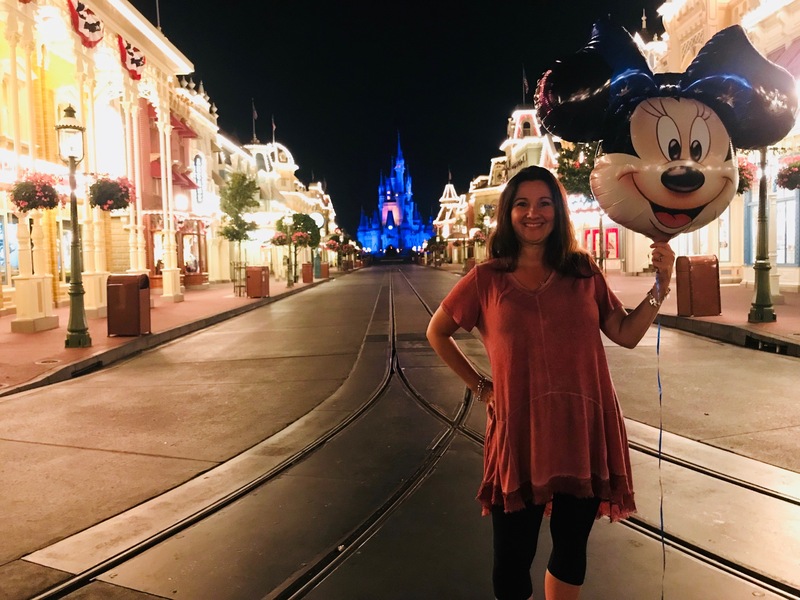 From most Disney resorts you’ll take the bus to Disney Springs where you’ll be dropped off at the new bus loop located centrally to all of the fun at Disney Springs. 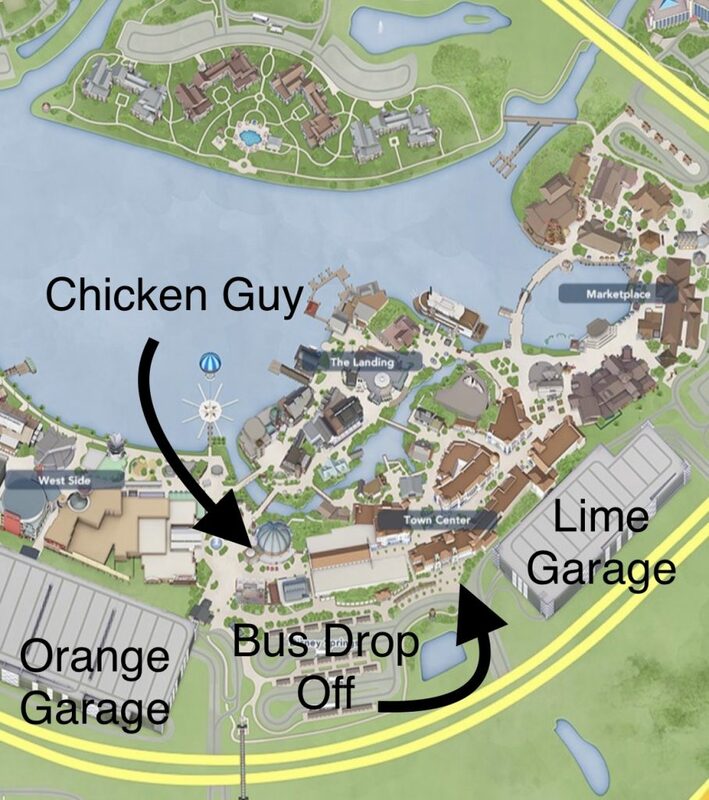 To get to Chicken Guy from the bus loop you’ll take a left when entering Disney Springs. 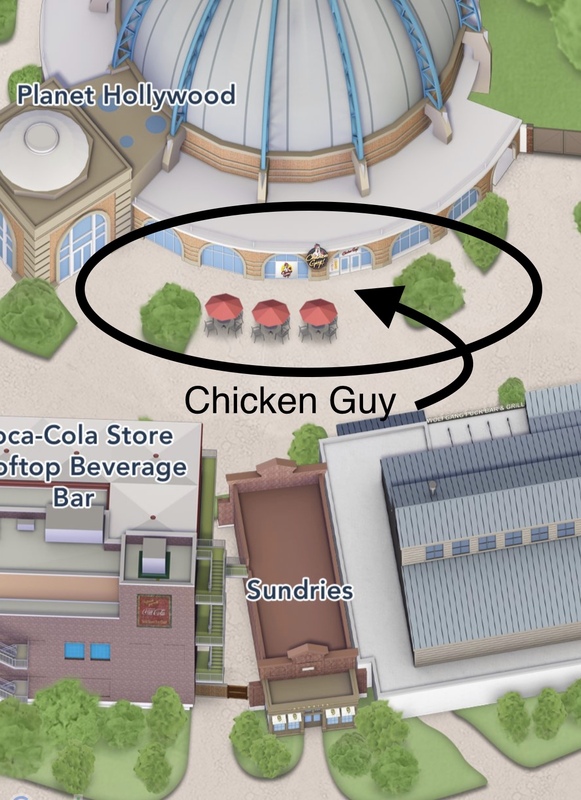 Chicken Guy is located behind Planet Hollywood near the Orange Garage. 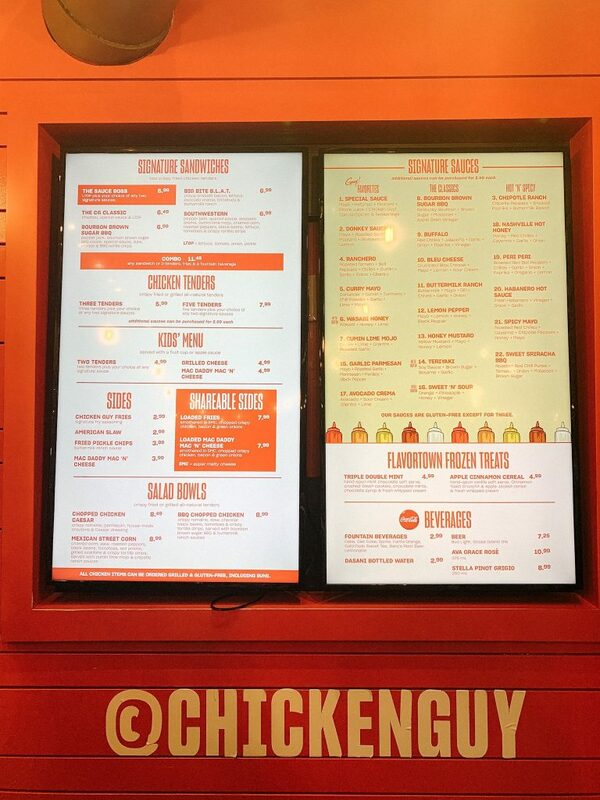 The menu at Chicken Guy is simple yet extensive at the same time. 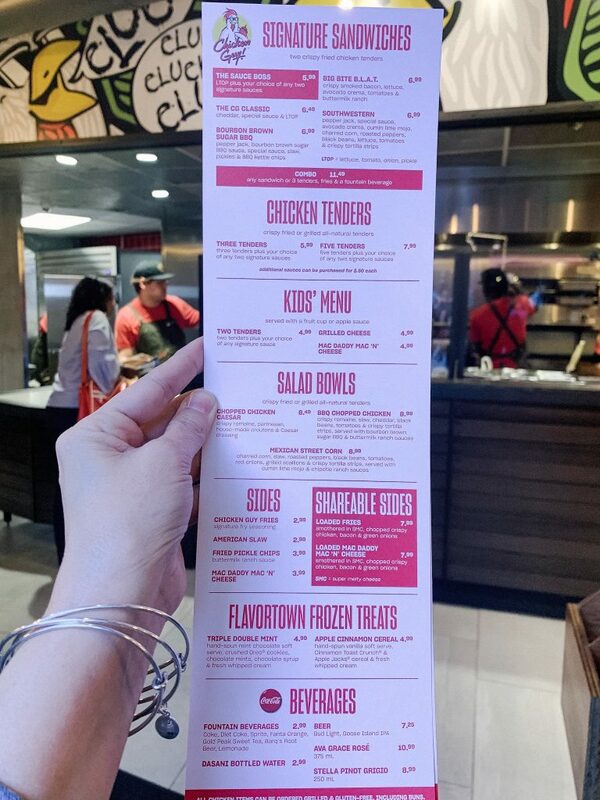 You’ll have the option to choose from chicken tenders, both grilled and breaded, chicken sandwiches, salads, smothered fries and mac and cheese! What makes the menu complex is the ability to customize each of these items with one or more of their 22 different freshly made sauces. Add on fries, they’re a must. The seasoning makes them some of the best you’ll ever have! All of the food is made fresh in the restaurant. The chicken is fresh never frozen, hand breaded and hand skewered nightly. The twenty-two sauces are also made right there at the restaurant using fresh ingredients. 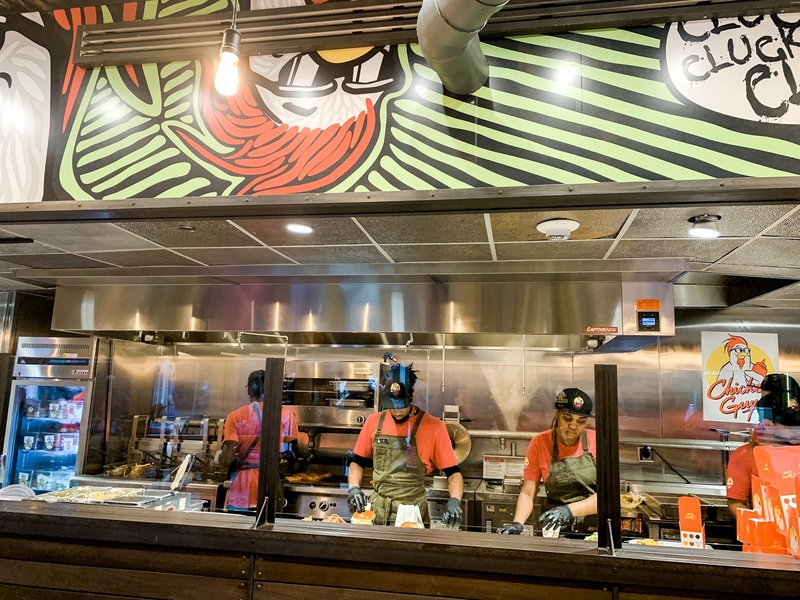 One of the fun things about Chicken Guy is watching your order being made on the food line right in front of you! Chicken Guy serves wine and beer but the specialty drinks worth talking about are the non-alcoholic milkshakes. You can choose between the “Triple Double Mint” and Guy’s favorite, the “Apple Cinnamon Cereal”. The “Apple Cinnamon Cereal” milkshake delivers a tasteful crunch filled with milk infused Cinnamon Toast Crunch and Apple Jack cereal topped with fresh whip cream. While I did not try either of these milkshakes because they are not gluten-free, my friends told me they were both pretty amazing! 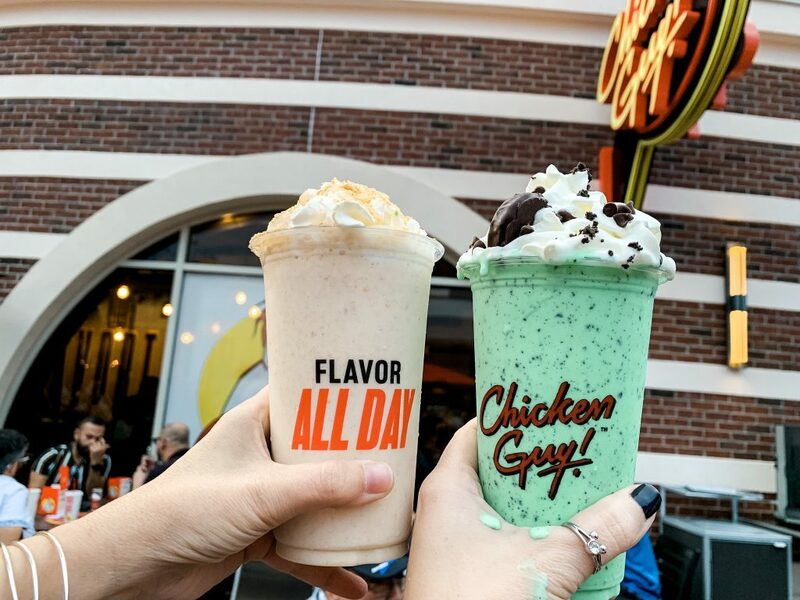 So make sure you try them and then tag me in your posts so I can see what you think about Chicken Guy and these creative milkshake concoctions! Chicken Guy’s menu features a few signature sandwiches that are made with two of their crispy fried chicken tenders or grilled chicken for a gluten-free option. I personally am so excited when a restaurant offers more than plain chicken or salad as the gluten-free option. And a gluten-free bun instead of a lettuce wrap totally makes my day! Shown above are the gluten free options I ordered (tray on the front left) and the regular menu items ordered by Casey and Serena. The Sauce Boss is Chicken Guys most popular sandwich (middle of the picture) and can be customized with 2 sauces of your choice. On the far right is the loaded mac and cheese, which can be ordered as your entree or as a sharable side. 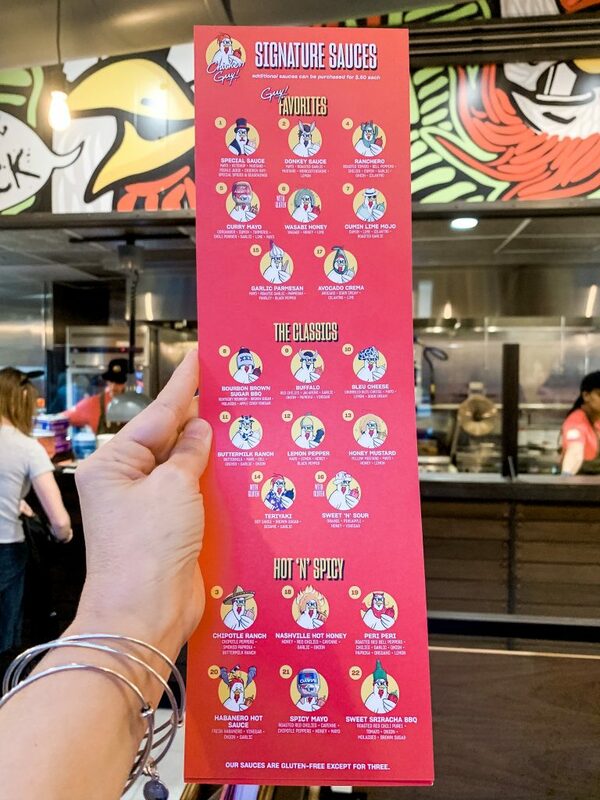 In the back, you’ll see ALL twenty-two house-made sauces at Chicken Guy. You get two sauces with each sandwich or order of chicken tenders and can order additional sauces for a small upcharge. I ordered the other most popular sandwich, the Big Bite B.L.A.T with a gluten-free bun and grilled chicken. The sandwich was smothered in Guys avocado cream and buttermilk ranch sauces which soaked into the bun nicely making this sandwich so yummy! I also ordered the smothered fries with grilled chicken instead of fried making this an awesome gluten-free option as well! They were so good! A great grown-up option to the typical cheese fries we all know and love! There is not a specific allergy menu at Chicken Guy. Ask for the allergy options when you order and know that the grilled chicken is available as both tenders or a sandwich with a gluten-free bun. The fries are also gluten-free and Chicken Guy has a dedicated fryer to ensure no cross-contamination. Salads are always an option if you have the gluten containing items removed. Make sure to let the cashier know you have a gluten allergy so the kitchen can prepare your food in a clean area. 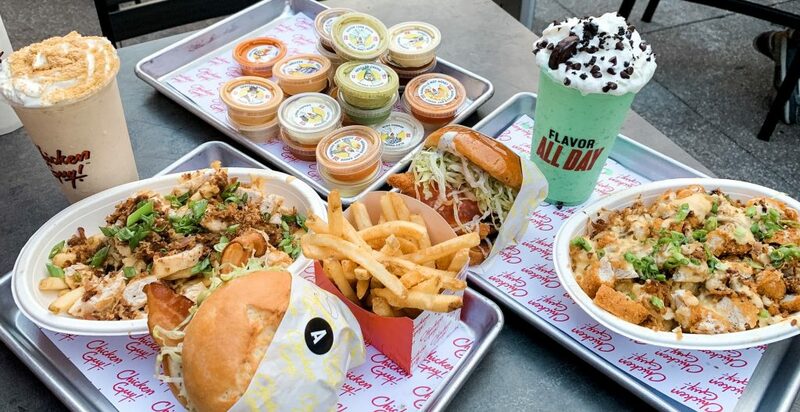 All but three of Chicken Guy’s sauces are gluten-free. These three are well marked on the menu. The sauces containing gluten are the Wasabi Honey, Teriyaki and Sweet N’ Sour. They’re the Asain sauces that contain soy sauce for easy reference. 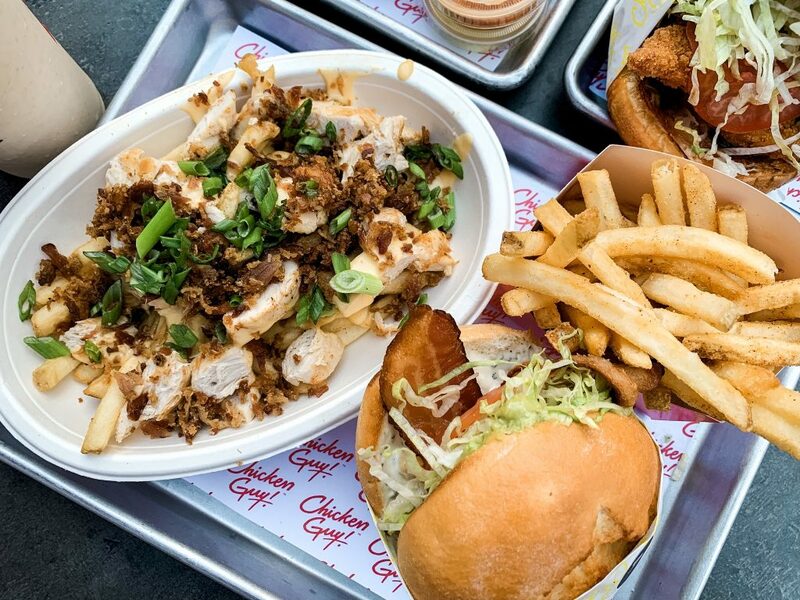 Dining Plans are accepted at Chicken Guy. Each entree item will use one quick service credit. The sharable sides are large and could easily be split as a meal between two people to get the maximum use out of your credits. 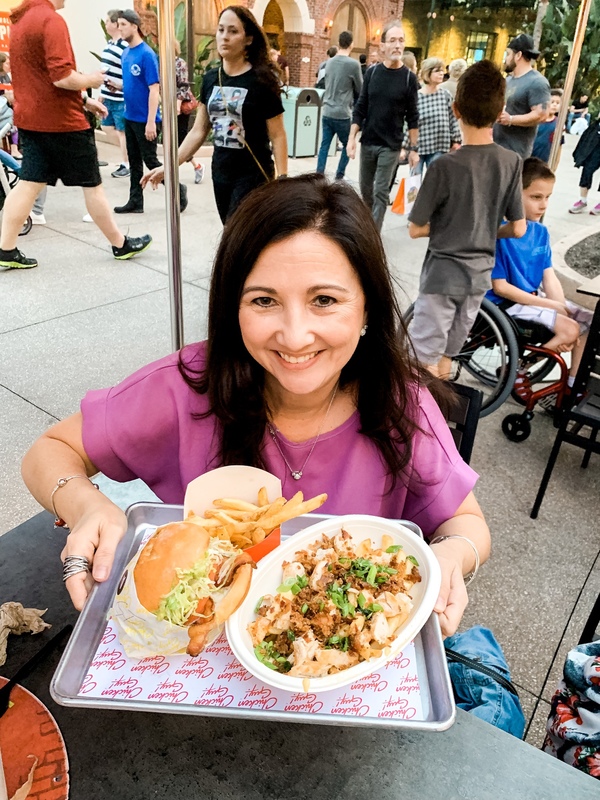 I was really happy with my meal at Chicken Guy and thought it was a great bang for my buck at Disney Springs. I could easily eat a sandwich, fries, and drink for $10 ish dollars and be full. The portion sizes were good for one person unless you choose a sharable side and then I think you could split it between two people as long as they’re not huge eaters. 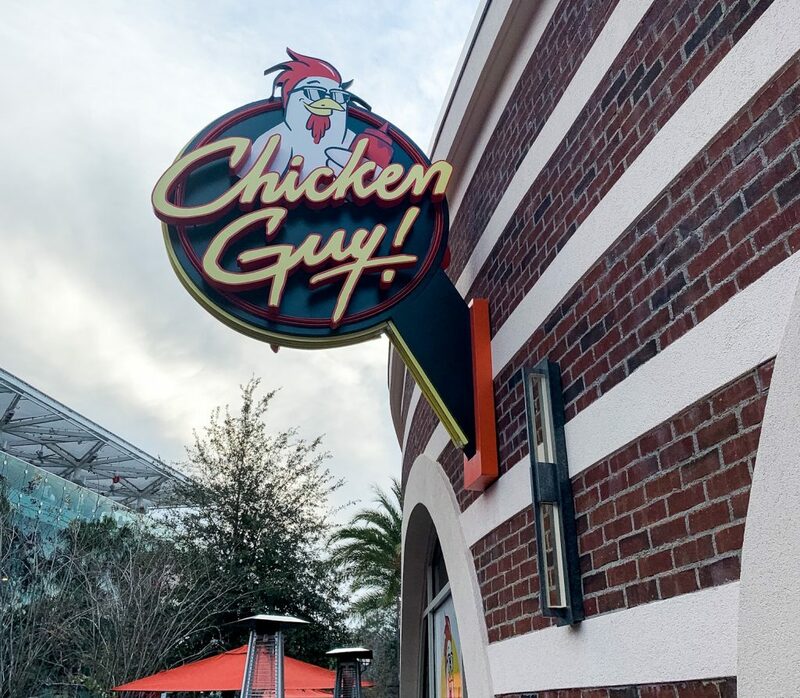 Next time you’re at Disney Springs give Chicken Guy a try and then tag me in your photos and tell me what you think!